I hope everyone knows that “Select all Instances” means every instance in the entire project file and not just the elements in the view. Anyway that is not what this post is about. 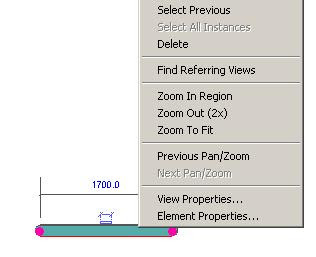 There are a few Revit elements that don’t have the “Select all Instances” function. Reference planes, Scope Boxes, Insulation, Revision Clouds and lines are some of the few deprived elements. The big down fall here are “Lines”, be that model or detail lines. Where is function would be very handy is in drawing clean up. There is to many times where non-standard line types end up in a project file. Without the “Select all Instances” it is near impossible to clean them out and switch them over to office standard line types. The only reason I can think of why Revit doesn’t allow you to “Select all Instances” for lines is maybe the lines with-in filled or masking regions can’t handle changing them without being in edit mode. If you do know, please do fill me in. From a management point of view, I’m not going to go through all 500 views in a project to out the non-office standard line types. There's a third party software called Ideate Explorer that will select all line instances. To right! I saw this product right after I made this post. Yes I really look forward to testing it. It looks like we are starting to see a lot of these 3rd party apps coming out for Revit. It can only be a good thing as it also puts pressure on Autodesk to keep up.